Translation : Mrs. C. Seidler, brought up to date by Dr. Paschoud. Date of publication of the official Valid Standard : 12.10.1998. Utilization : Companion and house-dog. Brief historical summary : The Kromfohrländer is one of the most recent German breeds and has been recognized internationally since 1955. Ilse Schleifenbaum who first bred it, lived near Siegen in southern Nordrhein-Westphalia near the district "krom Fohr" (in modern German « crooked furrow »), hence the name « Kromfohrländer ». 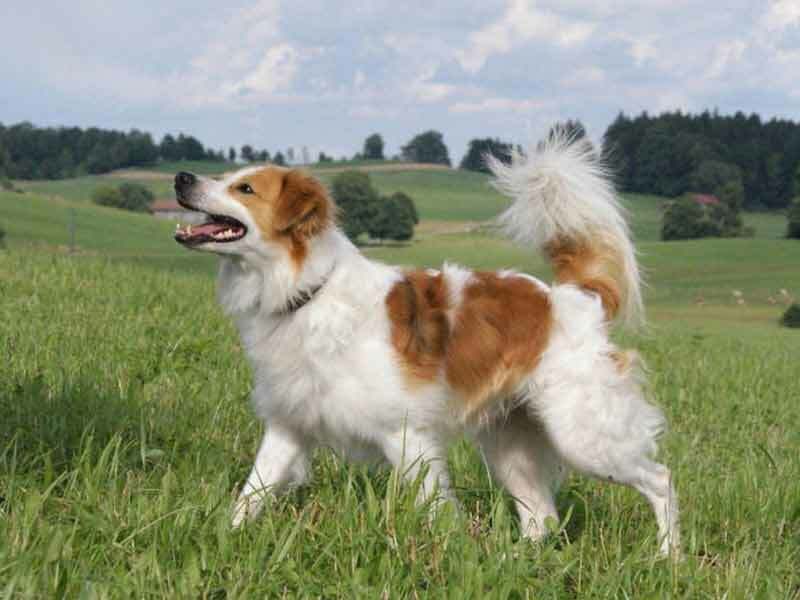 The breed ows its lovable temperament and character to its ancestors, the wire-haired Fox Terrier and the Grand Griffon Vendeen. Important proportion : The length of the body is slightly greater than the height at withers. Behaviour / temperament : Adaptable, docile and highspirited companion and house-dog, somewhat reserved about strangers, with a moderate hunting instinct. Aggressiveness and timidity not desired. Skull : Slightly roundish, no frontal protuberance. Frontal furrow indicated. Nose : Medium size, nostrils well opened, preferably black, brown permitted. Muzzle : Length of foreface in relation to length of skull = 1 : 1. Headplanes of muzzle and skull parallel. Nasal bridge straight, moderately broad. Seen in profile and from above tapering slightly to the tip of the nose. Lips : Close fitting, not too heavy ; labial corner tight, with dark pigment. Jaws/Teeth : Jaws strong with a regular and complete scissor bite ( 42 teeth according to tooth-formula of the dog), i. e. the incisors of the upper jaw closely overlapping the lower incisors, the teeth being set square the jaws. Pincer bite permitted. Cheeks : Strong musculature, fitting tightly from lower to upper jaw up to the cheekbone. Eyes : Medium size, oval ; set slightly slanting. Dark brown, medium brown permitted. Ears : Set on high at the side, semi-drop ear with the fold not lying above the top line of the skull, triangular shape with rounded tips, lying close to the head. Very mobile, carried depending on mood ; slight flap ear permissible. Profile : Rising obliquely, slightly arched nape of neck. Shape : Strong, well muscled towards back. Skin : Close fitting to neck, no dewlap. Upper line : Running straight, slightly longer than height at withers. Back : Strong, straight, medium-long topline. Loins : Slightly narrower than the ribcage, well developed. Croup : Slightly sloping, well muscled. Chest : Moderately broad and deep ; sternal line at level of elbows ; ribs lightly rounded ; forechest slightly pronounced. Belly : Tucked up towards loins. Tail : Not docked, medium long, strong at set-on ; sabre tail, slight ring tail permitted. Coat of tail according to type of body coat. At ease carried hanging with the tip slightly curved up ; in action carried as sickle tail over the back. General appearance : The position of the forelegs seen from the front is straight and vertical. Shoulders : Well muscled; shoulder blade moderately long and sloping. Upper arm : Angle to shoulder-blade about 110°, well muscled. Elbows : Fitting naturally to the body, neither turned in nor out. Angle about 120°. Forearm : Slightly longer than the upper arm. Vertical to ground and strong. Pastern joint : Well developed, but not too strong and thick. Pastern : Relatively short, seen from front in straight continuation of the forearm ; seen from side slightly sloping. Forefeet : Lightly arched, tight toes. Nails strong; pads well developed, dark pigmented. Pale nails permitted. General appearance : Seen from rear legs straight and standing vertical to ground. Upper thigh : Well muscled. Angle of hip joint about 100°. Lower thigh : Sinewy ; forms an angle of about 105° to the upper thigh. Hock : Similar to front pastern, but vertical to ground. Without dewclaws. Gait / movement : Flowing, active, with even strides ; front action reaching well forward, hind action with strong drive. Likes to jump ; no pacing. Skin : Taut connective tissues. Pigmentation according to coat markings. Rough coat : Thick, rough texture, with beard. At withers and on back hair not longer than 7 cm. Shorter on the sides, about 3 cm. The hair on the back and the fore-and hindquarters is harsher than on the sides. Longer hair on face and muzzle. Hair on ears according to type of coat on body. Undercoat short and soft. Smooth coat : Thick, smooth texture, without beard. At withers and on back hair not longer than 7 cm. Shorter on sides, about 3 cm. Coat lying close to body. The hair is longer on ears, lower side of neck and on the chest. Tail with good plume. Distinct feathering at rear side of forelegs and upper thighs desirable. On face and muzzle hair short. Undercoat short and soft. On body : Basic colour white with light brown, tan to very dark brown markings in shape of variously large patches or saddle. With a brown undercoat the tips of hairs may be black. On head : Light brown, tan to very dark brown markings on cheeks, above eyes and on ears ; divided as symmetrically as possible by a white blaze which reaches up to the forehead or to the nape of neck without any interruption ( symmetrical mask with blaze). Height at withers : Between 38 and 46 cm. Weight : For males from 11 to 16 kg, for females from 9 to 14 kg. Brown markings definitely too pale. Black shaded patches without brown undercoat. Absence of markings on body. Distinctly uneven markings on head. Absence of more than two molars or more than 3 premolars. Note : A singular missing incisor in the upper or lower jaw as well as a somewhat shorter or longer coat should not be considered an eliminating fault if the dog, in all other parts, is qualified as excellent or very good.